Just because it’s getting colder outside, doesn’t mean that folks will stay inside until springtime. As temperatures begin to drop and snow accumulations rise, active kids and adults begin clamoring for old-fashioned winter fun. 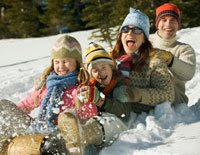 There are plenty of activities to keep everyone interested; skiing, snowboarding, sledding, and ice skating. There are also plenty of not-so-fun tasks that may need to be done, such as shoveling or snow-blowing, changing tires, removing Christmas lights and outdoor decorations. A few precautions can help ensure that everyone stays safe while working or playing outside. The most important thing is to dress appropriately. A good rule of thumb is to wear loose, lightweight, warm clothing in several layers. Trapped air between the layers acts as an insulator. Layers can be removed to avoid perspiration and subsequent chill. The fabric on outer garments should be tightly woven and water repellent. Always wear a hat or cap on your head since half of your body heat could be lost through an uncovered head. Cover your mouth and nose with a scarf to protect your lungs from extreme cold. Mittens, snug at the wrist, are better than gloves because fingers maintain more warmth when they touch each other. Kids should take indoor breaks every 30-40 minutes since they lose body heat faster than adults. And remember to have them drink water and wear sunscreen -- dehydration and sunburn also occur in the winter. If someone has had prolonged exposure to cold temperatures, especially in children and the elderly, you will need to check for hypothermia or frostbite. The symptoms for frostbite are different than hypothermia because there is no pain associated with the early stages of frostbite. People working or playing outside can develop frostbite and not even know it. First, the skin may feel numb and become flushed. Then it turns white or grayish-yellow and feels cold to the touch. Typically, frostbite occurs on extremities such as fingers, toes, tip of nose and ear lobes. If you encounter someone who may have frostbite, move that person to a warm location and cover the affected area with something warm and dry. Never rub the area. If a person's body temperature drops below 95 degrees Fahrenheit, get emergency medical assistance immediately! Remove all wet clothing, wrap the victim in warm blankets and give warm, non-alcoholic, non-caffeinated liquids until help arrives. Last winter, five people died after falling through the ice. Over the last 10 years, 52 people drowned after breaking through thin ice. Sixty-five percent of all ice drownings are vehicle related. Last winter, 22 people died in snowmobile accidents. Last winter, 49 percent of snowmobile deaths were alcohol or drug related.